Bleeding Gums are usually associated with poor dental hygiene and gum disease (gingivitis). But, it may also represent other serious medical conditions, such as bleeding disorders and cancer. What are the Signs and Symptoms of Bleeding Gums? If Bleeding Gums are a result of systemic medical conditions, like vitamin deficiencies, leukemia, or bleeding disorders, then various other signs and symptoms may be noted. How is First Aid administered for Bleeding Gums? 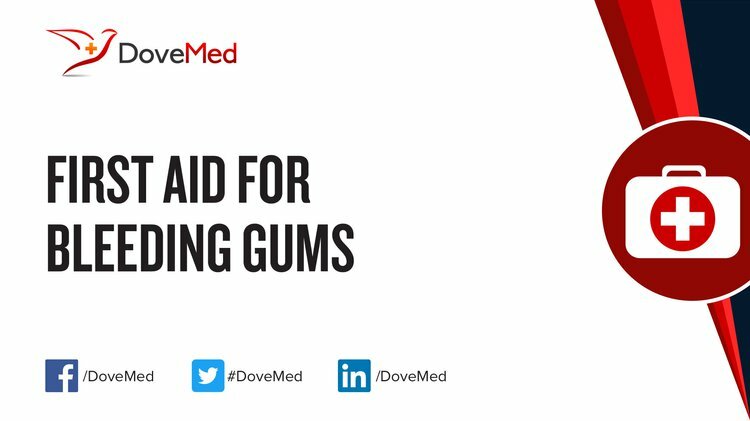 Who should administer First Aid for Bleeding Gums? The individual (himself/herself) with the Bleeding Gums or someone nearby can administer First Aid. What is the Prognosis of Bleeding Gums? The prognosis is dependent on the severity of gum damage and underlying medical conditions (if any). How can Bleeding Gums be Prevented? Kailio, P., Nordblad, A., Croucher, R., & Ainamo, J. (1994). Self‐reported gingivitis and bleeding gums among adolescents in Helsinki. Community dentistry and oral epidemiology, 22(5PT1), 277-282. Balhara, Y. P. S., Sagar, R., & Varghese, S. T. (2007). Bleeding gums: Duloxetine may be the cause. Journal of postgraduate medicine, 53(1), 44. Ungley, C. C., Durh, M., & Horton, J. S. F. (1943). SORE AND BLEEDING GUMS IN NAVAL PERSONNEL VITAMIN C AND NICOTINIC ACID INTAKES. The Lancet, 241(6239), 397-400. Berrevoets, M. A., & Bleeker-Rovers, C. P. (2016). Man with bleeding gums and skin rash. Annals of emergency medicine, 68(3), e65-e66. Ma, A. D. (2012). A Woman with Bleeding Gums. In Hemophilia and Hemostasis: A Case-Based Approach to Management: Second Edition. John Wiley and Sons. Webber, A. M., & Dalby, P. L. (2015). From Bleeding Gums to Green Thumbs: A True Story. In A Case Approach to Perioperative Drug-Drug Interactions (pp. 867-870). Springer New York.